Canada Water is a small lake and wildlife refuge in the heart of Rotherhithe in South London. It is one of the few remaining parts of the once extensive Surrey Commercial Docks that covered much of the Rotherhithe Peninsula during the nineteenth century. 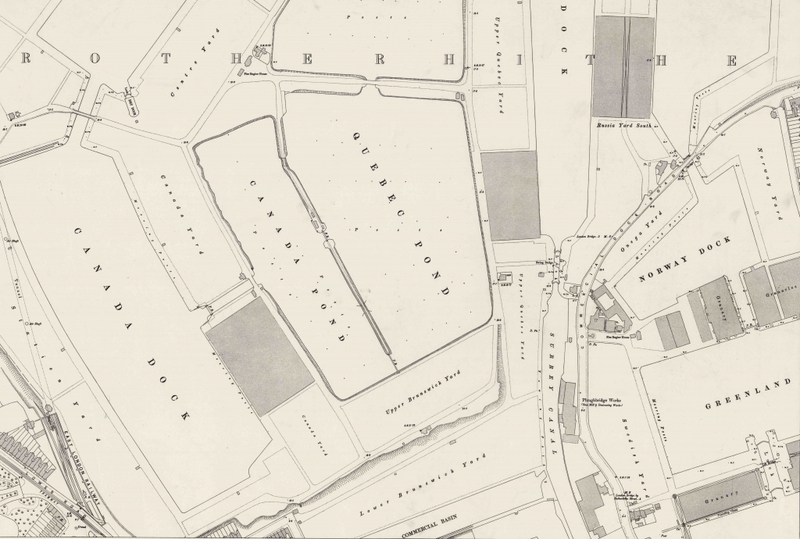 Canada Water was Canada Dock, the centre of the timber trade in London, where timber was unloaded into the water and formed into rafts that were stored in Canada Pond and Quebec Pond (see the map below). Liverpool’s Canada Dock, which was the centre of the timber trade on the Mersey River, remains intact and is still used to ship bulky commodities. The Canada Dock in Liverpool did not use storage ponds and instead the timber from Quebec, New Brunswick or the Baltic region (Russia, Sweden and Norway) was unloaded directly onto land. 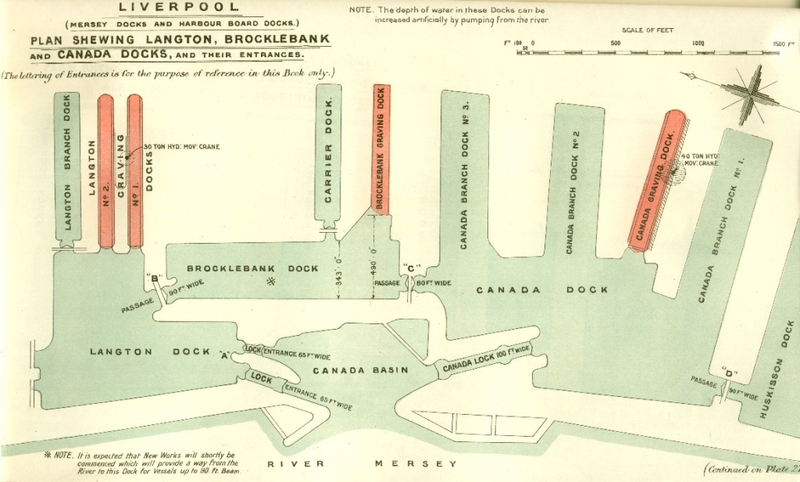 The threat of fire explained the remote location of the timber trade on the northern edge of the Port of Liverpool’s extensive network of docks. The names of these major sites of urban transportation infrastructure in Britain’s two largest nineteenth century ports suggests the importance of Canada and Quebec in supplying Britain with timber. Thousands of acres of forests passed through these docks before being transported to sawmills and then to building sites across the United Kingdom. Britain’s transformation into the first predominantly urban industrial nation relied on these docks and the ghost acres of Canadian and Baltic forests that supplied them to provide almost all of the timber used in construction. By the end of the nineteenth century, the Surrey Commercial Docks also had refrigerated warehouses to store large wheels of Canadian cheese. Other docks in Liverpool and London focused on unloading wheat, other grains and live animals shipped from the Port of Montreal. The flow of commodities from British North America and later Canada helped transform the waterfront in cities on both sides of the Atlantic. The ports of Montreal, Quebec City, Liverpool, Glasgow and London developed together through a process of interconnected synchronicities. While the British ports were shaped by trade from around the world, the timber trade from Canada and the Baltic were particularly significant because of the sheer bulk of the huge quantities of wood imported into the United Kingdom. In 1876, Britain imported 6.38 million loads (roughly equivalent of a ton) of timber, with British North America, Sweden, Russia and Norway accounting for the vast majority of the supply. This was a significant increase from the 2.51 million load imported in 1856. From July of 1876 to June of 1877, Quebec shipped 406,890 tons of white pine, 91,227 tons of oak, 55,568 tons of red pine, and 26,848 tons of elm to Great Britain. In the decades that followed, Russia and Sweden surpassed Canadian exports, but the pattern of Britain relying on Canada and the Baltic region to supply almost all of its timber continued. The timber unloading and storage infrastructure expanded significantly during the middle decades of the nineteenth century to deal with the increased imports. Liverpool’s Canada Dock opened in 1859 and London’s Canada Dock was completed in 1876 by combining two existing ponds, which increased the capacity to unload timber at the Surrey Docks. Unlike cotton, wool, tea, hides, rubber and many other commodities, where London and Liverpool accounted for the vast majority of imports in 1888, these two major ports only accounted for 21 percent of hewn timber and 41 percent of sawn and split timber. Many other smaller ports around in England, Wales and Scotland divided up the rest of the timber imports. Timber trades journals include advertisements for the expanded dock facilities at Barrow-in-Furness and the Ordinance Survey maps record numerous large docks along the west costs of England, Wales and Scotland, but we still need to do further work to identify which other ports were major destinations for vessels leaving Quebec during the nineteenth century. We think the cost of handling and transporting timber explain the need to unload it close to the sites of consumption, instead of at the two major ports. As a result, the timber trade provides an interesting case study to explore the urban morphology that came with the increased reliance on crucial ghost forests during the height of Britain’s urban-industrial development in the nineteenth century. Jim Clifford (Saskatchewan) is working with Stéphane Castonguay (UQTR), Michèle Dagenais (Montréal) and Colin Coates (York) on as SSHRC funded project, Commerce impérial et transformations environnementales : la formation des hectares fantômes dans la vallée laurentienne, 1763-1918. Annual statement of the trade of the United Kingdom with foreign countries, 1877, 19th Century House of Commons Sessional Papers, 1878, Proquest U.K. Parliamentary Papers (1878-054659). Tables of Trade and Navigation of the Dominion of Canada for the Fiscal Year Ending 30th June, 1877, Sessional papers of the Dominion of Canada, volume 4, 1878, Early Canada Online (9_08052_11_4). Silly question no doubt, but: what is a ghost forest? Not silly at all. I’m playing with the idea of ghost acres, which historians have used to describe the overseas land it took to grow commodities that feed British factories and people during the industrial revolution (i.e. sugar plantations in the Caribbean or cotton plantations in the southern United States). Timber is another one of these key overseas commodities that the British could not supply from their own forests and needed “ghost” forests in British North America and the Baltic to make urbanization possible. I should have adapted this post a bit more when I posted it on ActiveHistory.ca, but I’m busy trying to actually finish a paper about a different set of ghost acres that made London’s soap industry possible in the nineteenth century.